The other day I was looking at all the turning tools I have. Over the years, I have tried a lot of turning tools and I don’t care for most of them. Look at the picture and you will see around 22 tools and I had to wipe a lot of dust off some of them to make the picture. There are all kind of tools from old Craftsman tools to some really modern stuff to the Elbo Hollowing Tool lying on the stool. In fact, I do about 90% of my work with one tool and that is the one on the far end of the lathe bed. I really like the 5/8” bowl gouge set in a changeable handle. I use Oneway’s Sure Grip Hosaluk 17-1/2″ Tool Handle from the High and I love the thing. 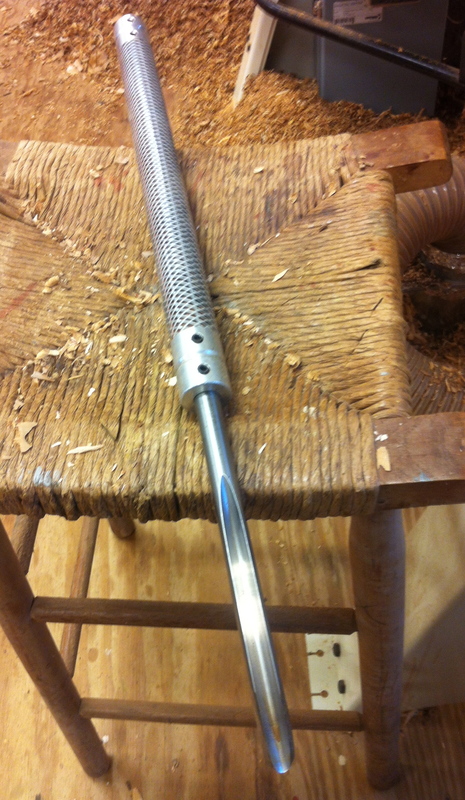 I put the Oneway Mastercut 5/8” Bowl Gouge in the Handle and the whole rig weighs close to three pounds. That solid weight makes it very easy to hold steady and almost all vibration from the cut is eliminated. I can knock out a bowl in short order with this tool and I recently bought a new gouge since I have about ground the length off my old one. A few years ago when I went to the Master Class on bowl turning with Mike Mahoney at the High, I took some of my turning tools to the class. Mike scoffed at the cutting edge I had on my bowl gouge. I had learned to make that “fingernail grind” shape from the instructions that came with the Oneway Wolverine sharpening jig. Mike has a way of sharpening which uses the grinder platform set at the angle he likes and which I have adopted. He adjusts the platform to about 15 degrees and then sharpens freehand from the platform. Once you learn how, the process is quick and easy and I have gotten where I can do it in less than a minute. What I see many beginners do is buy all the sharpening jigs and fixtures they can get their hands on. That collecting process is good for Highland, but makes your sharpening life more difficult in the long run. How much simpler to start the grinder, put the gouge on the grinder table freehand and in a short time be done. For you beginners, if you have never turned with a sharp tool you have no idea what you are missing. Find somebody who has a sharp gouge you can borrow so you can see what it feels like. Come on down to the shop and I will be happy to loan you one of my gouges for a bit. Here’s a hint: If all you see are small chips and sawdust coming off the gouge, you need to sharpen. If you are turning green wood, you should be seeing a continuous stream of beautiful long curls flying up into the air. In fact, look back at the top picture and note the long shavings on top of the box behind the lathe. That is the joy of turning and what turners live for. How many turning tools do you have and which is your favorite? Hey, Terry, how about a picture or two of the gouge on the platform? I’d like to learn this method of sharpening. Nice article. I think I agree with you about freehand sharpening. About those tools you don’t use any more. Would you consider selling any of them? If so, contact me at goodman.tom@att.net with pictures and prices. If you don’t want to sell, no worries, mate. I think what you said about the separate gouge and handle may have pushed me over the edge into getting a set. The Highland Woodworker – Episode 6! 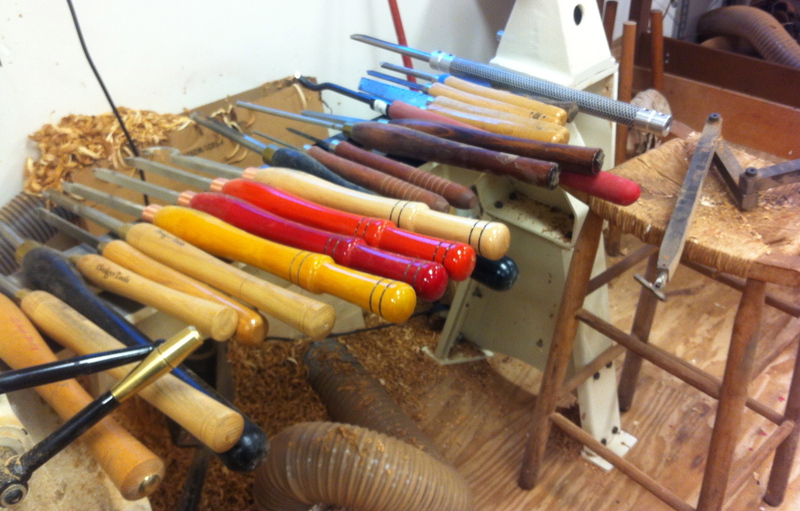 Take a look at the April Issue of The Highland Woodturner!